We now offer Wheelchair Accessible transportation. 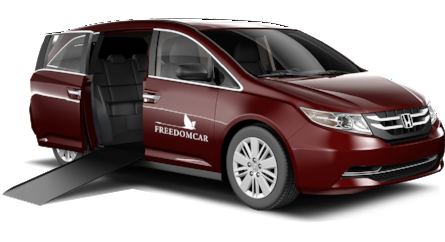 Introducing FREEDOMCAR MOBILITY: Our new state-of-the-art Honda Odyssey minivan is wheelchair-accessible to bring you greater mobility services in 2018. We are so happy to announce the newest addition to our fleet, a Honda Odyssey minivan fully equipped for wheelchair accessibility. 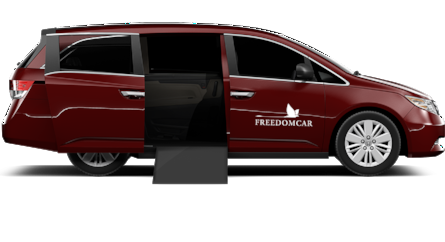 We’re calling this new private wheelchair transportation service FreedomCar Mobility because it will create new opportunities for clients who need non-emergency wheelchair transportation—from the company you already know and trust. This state-of-the-art wheelchair-accessible Honda Odyssey minivan provides ample space for up to 4 passengers including 1 wheelchair. It offers generous headroom (more than any other Honda mobility van) and the automatic in-floor ramp for easy entry delivers the premium experience that you’ve come to expect from all FreedomCar vehicles. We believe that all people, regardless of the conditions that govern their mobility, deserve an accessible transportation service that is invested in the safety, comfort and well-being of its passengers. To further the quality of these services, we ensure that each employee is trained to work with hearing impaired or visually impaired people, as well as those with other mobility challenges. Our drivers provide door-to-door service and are instructed on ways to handle many different passenger challenges with the utmost dignity and security, including wheelchair transportation safety standards while transporting clients in wheelchairs and mobility scooters. If you’d like to learn more about this new service, please give us a call at 410-321-5600. Thank you for choosing FreedomCar. As always, let us know if there's anything we can do to make your transportation experience with us even better. P.S. Please add our email addresses to your contact list or address book and feel free to connect with us on Facebook or Yelp.